Saving the world is not easy. In fact, it is a lot of work. And sometimes, you just need to let go, have some fun and dance. And that is exactly what participants at Jane Goodall’s Global Youth Summit did! After a few days of presentations, many discussions and a few too many hours indoors, a western themed vegetarian baroque was just what we needed. The evening was hosted by Whirlpool, who have been a terrific sponsor of the Roots & Shoots program and one of the sponsor’s of the first Jane Goodall’s Global Youth Summit. 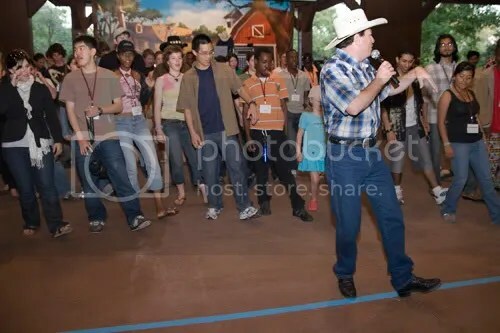 After enjoying a delicious vegetarian baroque, complete with chili, baked beans and baked potatoes, 100 youth from all around the world jumped on the dance floor for a little line dancing. Under the leadership of Cowboy Kip Sweeney (no relation to Shawn Sweeney! ), we learned three different dances. Throw in a few y’alls and by the end of the night, youth from places like Sweden, Australia, Nigeria and China would have fit in just perfectly in any country-western dance hall or saloon throughout the Mid-Western United States. 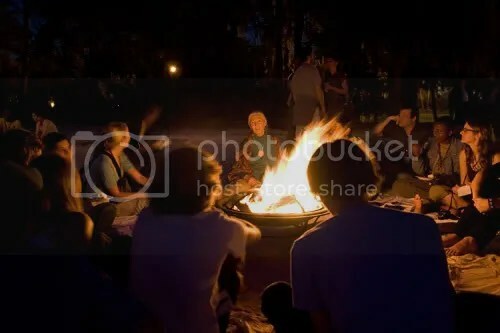 After quite a bit of dancing, the group moved down to a a little lake where a number of camp fires where set up. The participants got a chance to chat with Dr. Jane while sipping hot chocolate and watching a crackling fire. And would it have been a campfire without some songs? Although, you won’t find many campfires in the US surrounded by young people singing songs in Swahili, Disney is a magical place! I think the night was so successful and well received because it gave young from around the world a chance to relax and just have some fun. It is safe to say that it was a night that will be remembered by all who where there. 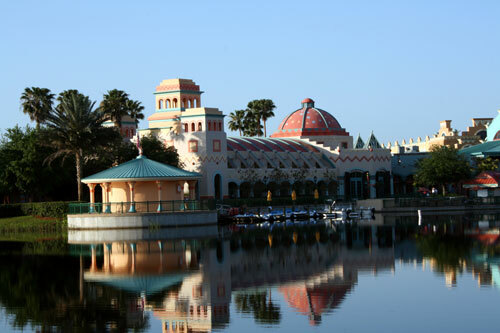 As we all gathered at Walt Disney World our schedule was jam packed. We were so excited to have the opportunity to gather with young people from around the world that we had to get as much done as possible. One of the most exciting things that we did was have N.A.P. Time. Not nap time, but N.A.P. Time. In preparation for the summit we left a few hours during our first few days completely blank. Completely open for the participants to decide what we would be doing. On their Day 1 evaluation each of the participants noted topics they would like to discuss. From the list of topics David and I put together a schedule of eight workshops over the course of two hours. Four in the first hour, and four in the second hour. These sessions were largely unplanned and lacked format. That was left to the participants to take care of. Below is a list of the topics they chose. …when we got to the end of the first session all of the participants said they needed more time for the first session! So we decided to push our topics to the next day, and allow everyone another hour to continue their discussions! Again these discussions were incredibly rewarding for the groups and everyone noted in their evaluations that they really appreciated having this time to talk about what was really important to them. Probably the most exciting thing about these meetings was that two Global Youth Councils have formed from the participants based on two of the sessions. The first is Global Youth Council for Wildlife Conservation which seeks to protect wild animals and conserve their habitat’s. The second is World Youth for Peace which is a group for youth all around the world to learn from each other about the conflicts we face and help each other work for peace. We are so excited that these groups have formed, and that it was N.A.P. time where the ideas were born! Each group had to find each other without making any noise except the noise that their endangered species makes. This highly amusing game kicked off the week by not just breaking the ice but introducing the participants to a few different summit themes such as cooperation and conservation. Dr. Jane also arrived and gave a rousing and inspiring talk to the participants (below). 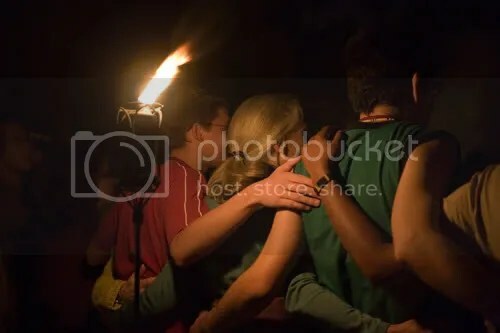 Jane spoke of how excited she was to see such a diverse group of people she even compared it to the very first youth summit held by the Jane Goodall Institute some eight years ago. She contrasted having 25 youth from five US cities at the first summit to having 100 youth from 28 countries at this summit! This event is a dream come true for Dr. Jane along with many other people including Shawn and myself. We are so excited to be together with our friends from across the world. After Dr. Jane’s talk we all moved inside to enjoy a tasty opening dinner. We were given a warm welcome by Dr. Jackie Ogden, Vice President of Animal Programs and Environmental Initiatives for Walt Disney World. There Dr. Ogden reflected on her personal hope for our future just by seeing and meeting all of us. What a great vote of confidence! Something that will for sure help us make this a successful week! Following Dr. Ogden’s words we heard from Pamela Mitchell, Program Specialist with the Diversity and Cause Marketing Department at Delta Air. Ms. Mitchell told us all about Delta’s community programs and how she was excited to see our Summit as a great addition to that programming. Our keynote Speaker for our opening dinner was former Youth Fellow and current JGI Board of Directors member Chase Pickering. Chase shared with us how a trip to Antarctica inspired him to get involved in Roots & Shoots and apply for the National Youth Leadership Council. Finally Chase shared how happy he was to see that we were meeting here at Disney because it was two years ago that he was down here with Dr. Jane when we were first talking about having a large gathering of young people at Disney. Following Chase, Mark Nieker, President and Executive of the Pearson Foundation, explained what the Pearson Foundation would be doing with the summit participants all week. A perfect follow up to Chase’s presentation, Mark explained the importance of taking stories like Chase’s and make them available to a wide audience and via the internet. There is no doubt that the Pearson workshops, focused on developing public service announcements will be a highlight of the summit. We closed out our night with NEYLC Member Nicole Coakley sharing with us information about Well Wishes and Blessings a campaign to send inspiration from American students to students in Iraq. Then LA Roots & Shoots Volunteer, John Zavalney shared with us a presentation and information about International Day of Peace and encouraged us all to participate this year on September 21st. In just a few hours, the first ever Jane Goodall’s Global Youth Summit kicks off here (above) at the Coronado resort in Disney World. About half of the participants have landed in Orlando an are making their way to the resort. Tonight the festivities kick off, with meetings of 10-12 participants in program groups, or the groups that they will be in throughout the summit, followed by a reception with a few words from our sponsors (Disney, Delta and Whirlpool) as well as Dr. Jane. Following the reception, participants will have about two hours, from 9-11 to get to know each other during what we are calling No Brain Cells Required time. This is simply a chance for people to make connections, no saving the world allowed! It will also be the time that each night Shawn and I will be recapping the day, so expect a post around 11ish each night. Along with plenty of pictures and even some videos!